The John F. Kennedy Space Center (KSC) is one of ten National Aeronautics and Space Administration field centers, and is NASA’s Center of Excellence for launch and payload processing systems. Located on the east coast of Florida, KSC is adjacent to Cape Canaveral Air Force Station (CCAFS). The management of the two entities work very closely together, share resources, and even own facilities on each other’s property. KSC has been NASA’s primary launch center of human spaceflight since December 1968. Launch operations for the Apollo, Skylab and Space Shuttle programs were carried out from Kennedy Space Center Launch Complex 39 and managed by KSC. Though the first Apollo flights, and all Project Mercury and Project Gemini flights took off from CCAFS, the launches were managed by KSC and its previous organization, the Launch Operations Directorate. Starting with the fourth Gemini mission, the NASA launch control center in Florida (Mercury Control Center, later the Launch Control Center) began handing off control of the vehicle to the Mission Control Center shortly after liftoff; prior missions held control throughout the entire mission. Additionally, the center manages launch of robotic and commercial crew missions, researches food production and In-Situ Resource Utilization for off Earth exploration, and more. Since 2010, the center has worked to become a multi-user spaceport through industry partnerships, even adding a new launch pad (LC-39C) in 2015. There are about 700 facilities grouped across the center’s 144,000 acres. Among the unique facilities at KSC are the 525 ft tall Vehicle Assembly Building for stacking NASA’s largest rockets, Operations and Checkout Building which houses the astronaut crew quarters, and 3-mile-long Shuttle Landing Facility. There is also a Visitor Complex open to the public on site. The military had been performing launch operations since 1949 at what would become Cape Canaveral Air Force Station. In December 1959, the Department of Defense transferred 5,000 personnel and the Missile Firing Laboratory to NASA to become the Launch Operations Directorate under NASA’s Marshall Space Flight Center. President John F. Kennedy’s 1961 goal of a manned lunar landing before 1970 required an expansion of launch operations. On July 1, 1962, the Launch Operations Directorate was separated from MSFC to become the Launch Operations Center (LOC). Also, Cape Canaveral was inadequate to host the new launch facility design required for the mammoth 363-foot (111 m) tall, 7,500,000-pound-force (33,000 kN) thrust Saturn V rocket, which would be assembled vertically in a large hangar and transported on a mobile platform to one of several launch pads. Therefore, the decision was made to build a new LOC site located adjacent to Cape Canaveral on Merritt Island. NASA began land acquisition in 1962, buying title to 131 square miles (340 km2) and negotiating with the state of Florida for an additional 87 square miles (230 km2). The major buildings in KSC’s Industrial Area were designed by architect Charles Luckman. Construction began in November 1962, and Kennedy visited the site twice in 1962, and again just a week before his assassination on November 22, 1963. On November 29, 1963, the facility was given its current name by President Lyndon B. Johnson under Executive Order 11129. Johnson’s order joined both the civilian LOC and the military Cape Canaveral station (“the facilities of Station No. 1 of the Atlantic Missile Range”) under the designation “John F. Kennedy Space Center”, spawning some confusion joining the two in the public mind. NASA Administrator James E. Webb clarified this by issuing a directive stating the Kennedy Space Center name applied only to the LOC, while the Air Force issued a general order renaming the military launch site Cape Kennedy Air Force Station. Located on Merritt Island, Florida, the center is north-northwest of Cape Canaveral on the Atlantic Ocean, midway between Miami and Jacksonville on Florida’s Space Coast. It is 34 miles (55 km) long and roughly 6 miles (10 km) wide, covering 219 square miles (570 km2). 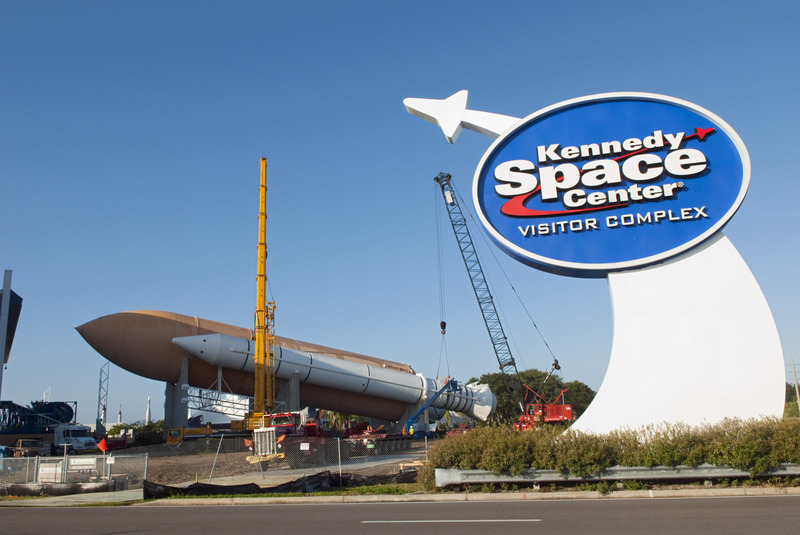 KSC is a major central Florida tourist destination and is approximately one hour’s drive from the Orlando area. The Kennedy Space Center Visitor Complex offers public tours of the center and Cape Canaveral Air Force Station.